Pour Nicolas Bayer, initiateur du projet, les hommes n’aimaient plus aller dans les salons de coiffure. La majorité des salons étaient mixtes et sans service particulier. Chez Bayer & Bayer au contraire, vous profiterez d’une attention toute particulière propre aux rasages à l’ancienne. Taille de barbe, mise en forme de moustache, coupe de cheveux classique ou moderne, c’est aussi pour vous Messieurs, l’opportunité de vous offrir un vrai moment. « Pour nos clients, aller chez son barbier doit être un événement.» L’atmosphère années 50 et so british, son bar à l’entrée où vous pourrez déguster un excellent whisky, confèrent ainsi au salon une chaleur particulière, accueillante et conviviale. Entre la soirée de lancement et le concert de clôture, les événements se multiplient. Bien plus que le service offert par un barber shop classique, Bayer & Bayer, c’est aussi une série d’activités, des soirées et un bar ouvert toute l’année. Bayer & Bayer, located in a traditional townhouse in Sablon in the heart of Brussels, is a barbershop that caters exclusively for men. It was opened ten years ago, when the owners set themselves a sizeable challenge: ‘We wanted to create a barbershop that had a sense of camaraderie, where customers could build connections with each other, regardless of class or background’. Owner Nicolas Bayer knew that many men felt out of place when getting their hair cut at beauty salons or hairdressers, and noticed a gap in the market. 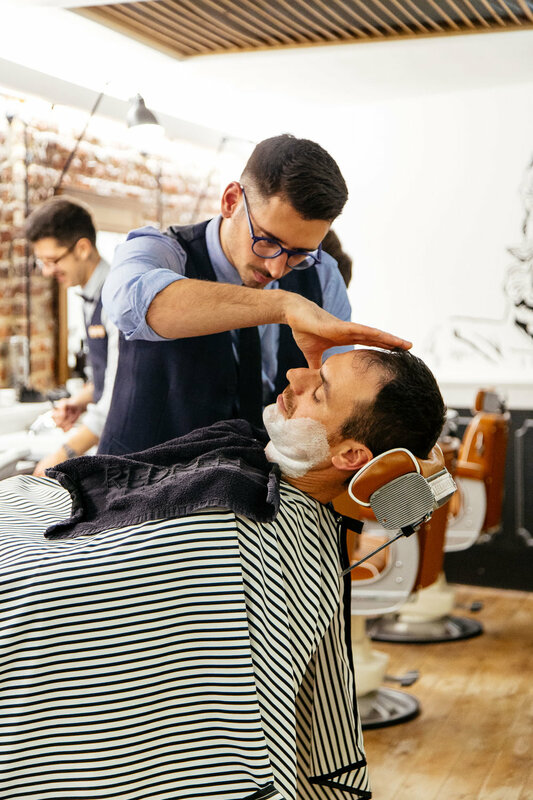 He decided to create a uniquely male gathering spot, where customers could receive a quality service and a traditional wet shave. Beard trimming, moustache shaping and hair cutting are some of the other services on offer. The perfect excuse to sit back, relax and enjoy some ‘me time’. ‘We want our clients to think of coming here as an experience’, says Nicolas. The barbershop’s distinctive British and 50’s influences, and bar offering fine whiskies, lend the space a certain warmth and a welcoming atmosphere. Pollen had the privilege of attending the launch of their Movember event. The Movember Foundation, originally launched in Australia in 2003 (but now a worldwide operation), raises money for research into men’s health issues. The idea is for people to raise awareness of these issues by growing a moustache for the month of November. Various barbershops around the world, as well as in Belgium, support the foundation in the form of donations. ‘One of the first rules of Movember is to start the month clean shaven, so today people have come in for just that. On 30th November, we’ll mark the end of the month-long event with a rockabilly concert, from which all of the proceeds will be donated to the charity’. Several other fundraising events will be held between launch night and the closing concert. Bayer & Bayer, offering so much more than your standard barbershop, is proud to be hosting a series of events and soirées. As if that wasn’t enough, the bar is open all-year-round!